Get access to 448 .premium topos made and maintained by locals. .premium topos are made and maintained by people who know the region very well. You will always have the latest information in your pocket. 🏔 Download topo and use anywhere. Use our app and download topo. A bad internet connection in the mountains or a dense forest will no longer stop you from accessing topos. 🙌 .premium supports the development of climbing. Use .premium, and you support the development of climbing areas. In 2017 we raised over 20 000€ to local developers. Buy monthly or annual .premium subscription and use topos from 448 crags without limits. With .premium subscription you can use topos from 448 crags without limits. Got a gift code? Click here to use it. What’s the difference between .premium and community topo? Anyone can start making a community topo. It means that the quality of information varies a lot. Topos in .premium are made by people who know the region very well, and the quality is as accurate and comprehensive as possible. Why can’t I buy one topo instead of a subscription? In a digital climbing guidebook, the work doesn’t end when the topo is purchased but continues in the form of constant updates from topo editors and improvements in the service. 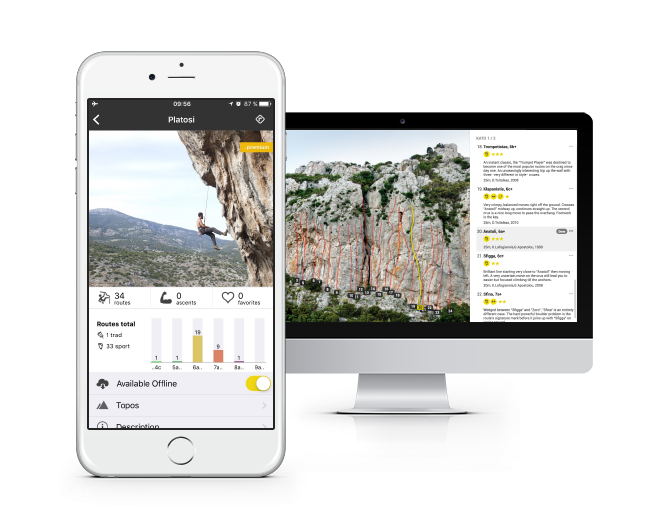 The subscription model allows us to guarantee you will get the most out of your climbing adventures with up-to-date information. How many crags are included in .premium? Currently the number is 448 including places like Fontainebleau, Magic Wood and Céüse, and the number is growing rapidly. With a subscription, you can access them all without limits. How much topo maker gets from my purchase? We pay 50% of the monthly subscription profit to topo editors. Based on a number of uses/topo, monthly payment to each topo maker varies from few euros to over 1000€/month. How to unsubscribe from .premium? Check out more from our FAQ or ask more in chat below!